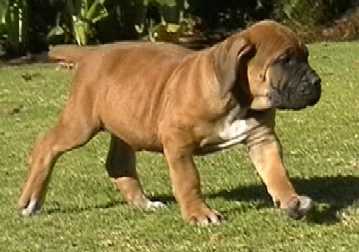 Baden Boerboels, new owners page. new owners had to say below. As promised, here's a picture of Kaya at 5 months. you posted of her development. 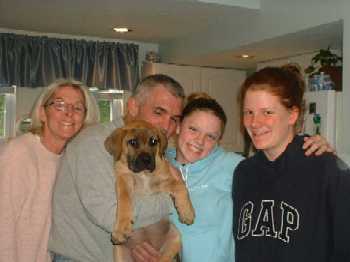 "We got our pup "Bo" at 10 weeks old from Attie. He made the entire process of importing him a pleasant experience. received him and now at 5 months old his protective instincts are starting to show. He is a good family pet and has a lot of personality. Bo is a true joy to have in our home." because they are of the same size. 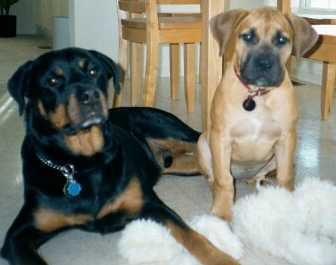 She also gets along well with my older Rottie. She has already become a lap dog, preferably my lap. As soon as she lays on me, she will go to sleep. She is sweet, thank you for sending her. Attie, hardstikke bedankt! Je hebt een geweldige pup voor me uitgekozen! How are you? 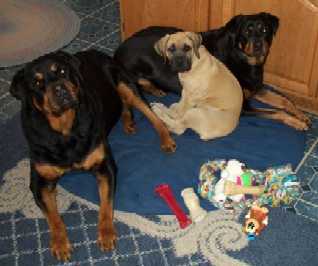 Nala is doing great , she is a BEAUTIFUL pup .. were so glad to have her .. we sent you a pic of her from my friends digital camera .. from left to right is my mother .. ( mary ) my father ( bob ) .. Nala .. Bridget ( me ) and my friend emily .. we will have some more pictures soon ..
"Your Boerboel puppy arrived in fine shape. He is a sweet, friendly creature and has captured my heart. 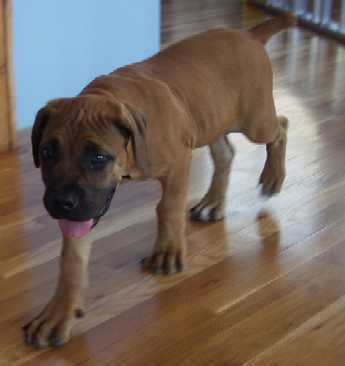 We have decided to name him Bosun. 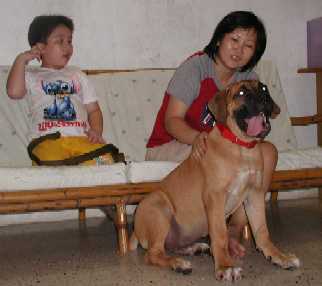 He is already so massive - at least compared to the American Bulldog puppy we got in June. She's three weeks older than he, stands about as tall, but looks petite in contrast. I am looking forward to watching him grow and to having him become invaluable to us. Thank you for all the good care you took in raising him. - Sally"
" Thank you again for your expertise in choosing Koa. I believe he has the perfect temperment for Shutzhund or any other sport we may decide to participate in. Of course the most important thing is that he is a perfect family companion. I am happy to report that the pup I received from you (Kiara) is doing very well. 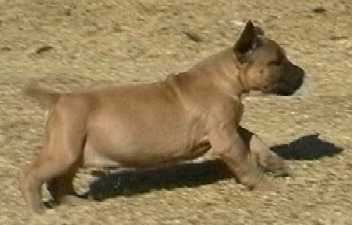 She is extremely muscular for such a young puppy. 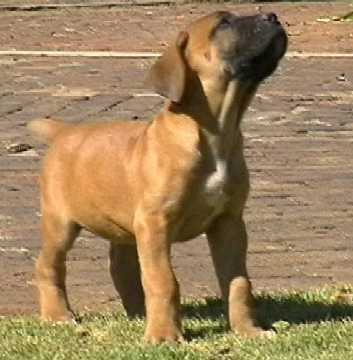 This is my third boerboel and I am sure that she has better muscle development than my first two males at the same age. 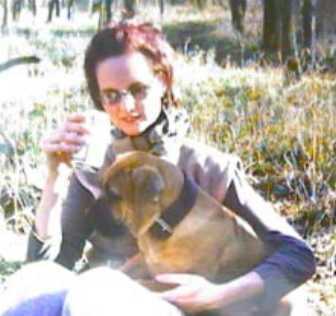 Attie you are doing a wonderful job in selcting and breeding, as I have seen this in the quality of pup you have given me. Kiara is a little spoilt as she gets a bit of preferential treatment from my wife. A picture of the new family member named Baden Kubla, a few days after his arrival.. As you can see he is already cooking up a storm. He is lovely, huge and settling in very well. Kubla's flight to us went well thanks to all the planning on your side. You can be proud of your professional approach. Thanks once again Attie. It's a pleasure doing business with you. beautiful!!! We will keep you up to date on his progress. Thank you again for your professionalism and honesty. It has been a pleasure to do business with you. use us as a reference if needed. Here,s the picture of Baden Zimba. He,s doing really fine with us.When he arrived one month back he weighed 16 Kgs.Now he is at 30 kg.s.You can post his pics.on your website.He is beginning to show his guarding instincts already.I think he will grow up to be a good guarding companion.Thanks, Attie for your help in choosing the best for me.